At Holistic Specialists we apply the latest in functional medicine, addressing the underlying causes of your weight loss needs (instead of just treating symptoms) so you can get well and stay well without unnecessary drugs or surgery. There’s no single cause of the obesity epidemic. It’s a complex process that involves both environmental and genetic factors. More precisely, obesity is caused by a mismatch between our predominantly ancestral genes and our modern lifestyle. There’s little doubt that eating too much and not moving around enough play an important role. But processed and refined foods, sleep deprivation, stress, environmental toxins, poor gut health, food sensitivities, endocrine imbalances, chronic infections, and nutrient deficiencies have also been shown to directly contribute to weight gain. This explains why many conventional approaches to weight loss fail just paying attention only to the symptom (excess fat) and not the underlying causes of that symptom. Our advanced functional medicine program helps our patients lose weight naturally by identifying the core functional deficiencies to treat the root causes. By cleaning up the diet, sitting less and moving more, achieving deeper sleep, managing stress, and healing the gut we ensure a long lasting optimal weight maintenance. Find the root cause of your weight gain with Functional and Evolutionary Medicine, a holistic, investigative approach to healthcare that is both high-tech and high-touch. 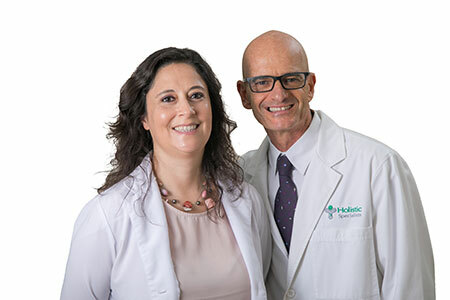 Andrea Bretal, MD & Diego Rutenberg, L.Ac.